Looking for the Perfect Home Away from Home? An energy-efficient cabin from EPS will provide you with a perfect escape from your hectic life while allowing you to save money on maintenance and energy costs. The best construction techniques and details are used to protect against cold, heat, moisture, drafts, and noise. Your cabin can be erected in a matter of days, engineered for maximum strength and durability while still utilizing loft space and vaulted ceilings. Your new cabin uses less energy which results in less pollution into the environment. EPS offers a variety of finish options as well as design options that are easily expandable in the future. Can a cabin be bigger? Your new cabin may be smaller in square feet, but it can be bigger in quality and comfort when you choose EPS! A cabin design integrates the same energy-efficient technology as a larger home so you can enjoy the same comforts. Call it a cabin, a cottage or your special get-away. Whatever lifestyle you choose, we'll manufacture your new place for your unique space. Build it in the woods, or next to the lake--a SIP home is versatile enough to fit narrow or unique lot sizes. EPS has specially designed cabin floor plans, complete with pricing. Check them out now! 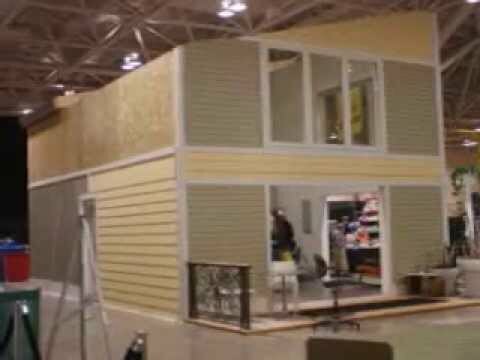 Watch as an EPS crew builds the Lakeview Cabin for an exhibit at the Minneapolis Home Show.